Accurate tests in few seconds on 12 Volt batteries in stock or on the vehicle. Tests discharged batteries down to 9 Volts with no need to charge them before testing, with automatic temperature compensation. No heat, no sparks, no damages to the vehicle ECU. 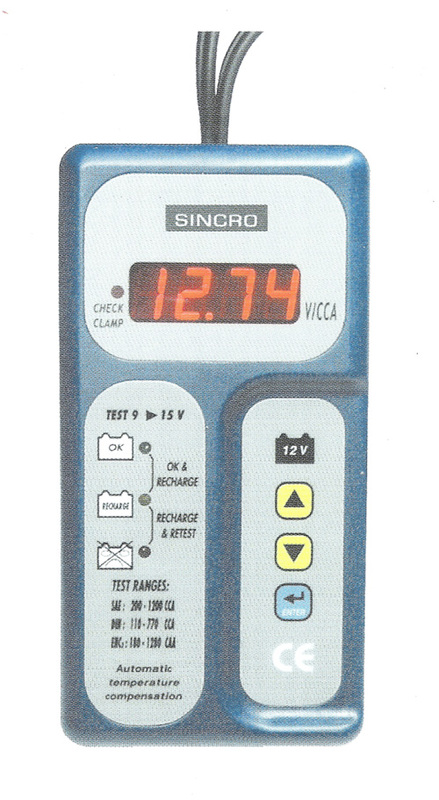 Displays the charging voltage with 2 decimals, the CCA (Cold Cranking Amps) according to SAE, DIN and ENc2 standard, as chosen by the operator. Green, yellow, red LEDs to indicate: pass - pass & recharge - recharge & retest - fail. IM0310 - Plastic carrying case.